A clean aquarium is easy to appreciate. It is when you can’t see the fish that problems arise. That is why it is essential to keep both the exterior and interior surfaces clean. While dust and smudge marks are easily removed from a tank’s exterior with the use of aquarium safe cleaners, interior surfaces can be more problematic. Two of the primary sources for dirty glass is algae and hard water build-up. You can prevent both to a degree, and regular cleaning is part of the solution. Algae is a natural part of the fish keeping hobby. Experienced owners know all too well about the battle with Green Carpet algae or the tougher Green Hair algae. While algae can perform important functions within an aquarium environment, it can become more than a nuisance when it is left unchecked, especially when trying to see through it. Light and nutrients are the two main sources of algae growth. Overexposure from aquarium lights or direct sunlight can stimulate growth. Within the water itself, nitrate and phosphate will feed algae growth. Feeding your fish sparingly and controlling the amount of light in the tank are the two best ways to avoid excessive algae build-up. Testing tap water, maintaining filter media, and regular water changes will help to prevent problems as well. Using live plants and algae eating fish are also effective controls. Excessive build-up of Green Carpet algae or Green Hair algae on glass can be removed with a variety of glass cleaners. Beard algae can become a problem in planted aquariums. The only way to remove it is to remove the leaves or driftwood that is infested. Many aquarium enthusiasts live in an area where the local water supply is mineral-rich. While water treatments can help with this issue, it may prove to be challenging to avoid hard water completely. Certain fish may also prefer hard water for their environment. As this water evaporates, the minerals that are left behind will begin to build-up within the aquarium. The residue will start to give the tank an unkempt appearance. It will also make it more difficult for you to view the fish and their living space. Excessive build-up (even in a tank with fish that prefer hard water) can lead to toxic levels of some minerals. If hard water is required, the best way to combat this residue is to replace the water that evaporates. If it is not a requirement, then use distilled water for your fish tank. If you find residue that needs to be cleaned, do not use regular cleaning products (even on the tank exterior). There are aquarium cleaners that are designed to use on tanks and are fish-safe. In many instances, patches of build-up can be cleaned using an algae cleaner or blade. Spray Cleaners: Typical household cleaners contain ingredients harmful to fish. Special cleaners are available that can be safely used to keep the outer aquarium glass free from dirt, dust, and smudge marks. Spray cleaners can also be great to use on new or used tanks before they are filled. Sponge Cleaners: Cleaning aquarium surfaces with a sponge is an effective way of removing most algae (and some hard water residue). The sponge material is stiff and will offer enough abrasive power to scrub away build-up. They are usually sold with a handle that allows you to reach the glass without having to get your hands wet. Scraper Cleaners: A scraper uses a solid metal or plastic surface that is moved along the glass to break away build-up. This is accomplished with a tapered edge or blade. A scraper can be handheld, but will most often come with a handle or use magnets to move the scraper around the tank interior. You want to match a cleaner to your aquarium. Most cleaners will work fine with a glass tank. Some cleaners may be too abrasive or sharp to use on acrylic surfaces and could scratch them. Build-up can be removed, while surface damage cannot. A sponge or scraper edge needs to be able to clean the entire glass surface, including sharp corners. A sponge may be more effective than a scraper in an acrylic tank with a rounded surface. The cleaner surface needs to match up well with tank’s size, as a small cleaner will require far more work. Finally, the cleaner must allow you to reach near the bottom of deeper tanks. An efficient scraper with a good reach for average aquariums. This scraper is made of stainless steel, making it anti-rust and corrosion resistant. The use of a blade in the design offers you an excellent choice for all types of algae removal. Its blades are easy to install and replace. A Right-angle blade offers a great design to reach into sharp corners that are found in most tanks. The blade comes with a protective sleeve that should keep it in great shape over time. This tool’s blade may scratch acrylic tanks without careful use. The scraper edge is 2.3 inches wide, which may present you with difficulties in smaller tanks or round surfaces. 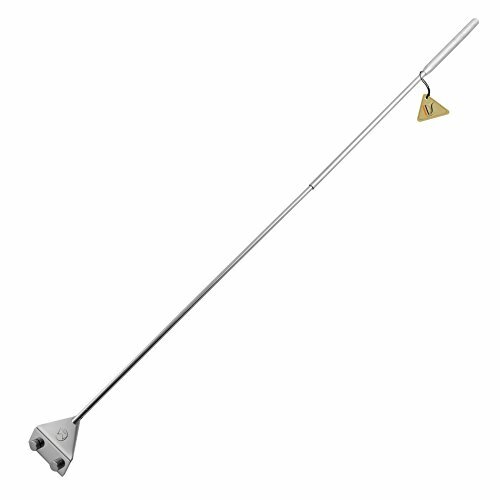 A handle extension is included that attaches to the 15.5-inch handle that brings the total length of this product to 26-inches. You may experience flex in the handle if you apply a lot of pressure. An ergonomically designed hand-held magnetic cleaner for medium glass. This magnetic cleaner from KEDSUM is designed to work on tank glass ranging from 0.31-0.55 inches thick. The body is made of an ABS and PVC plastic that should provide plenty of longevity. An ergonomic design will make this product more comfortable to use than some magnetic cleaners are. A powerful magnetic pull secures the cleaning surface, a feature that will help to remove algae with minimal passes. The pad is 2.28-4.13 inches, a surface size that will cover a lot of glass evenly. The magnet system is powerful, which could be startling to fish if cleaner snaps together without twisting it first. Care should be used when using, as the power of the magnets may cause a pinch to the skin if you are not careful. 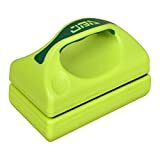 Due to the plastic material the handle is made from, this magnetic cleaner should be kept away from heat sources in order to prevent possible damage. An economical scraping pad attached to an 18-inch handle. 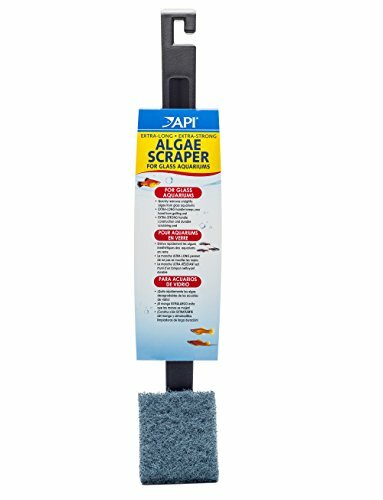 API’s pad scrapper is an economical glass cleaner. The pad material is abrasive, which is a great option to quickly remove trouble spots that may be hard for other cleaners to remove. The pad offers more flexibility than a blade scraper, which can be useful in hard to reach areas. Unlike a scrapper, the pad will help to trap some debris as you use it. The surface of the pad will cover more glass area than a blade is able to, which could lessen the time needed for cleaning. The pad can be rinsed before and after use to keep it cleaned properly. This item is designed for use on glass surfaces only. The angle that the pad is attached at will require you to remove the aquarium lid to take advantage of the entire pad surface while cleaning. An effective hand-held magnetic cleaner for smaller fish tanks. 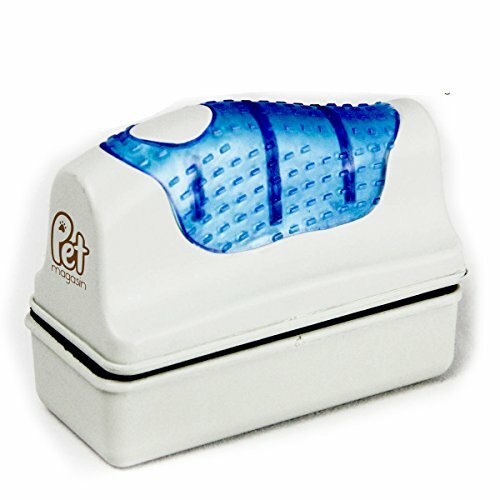 The Pet Magasin is simple in design and easy to use. This product produces plenty of magnetic strength, a feature that provides a powerful clean. A textured handle supports your grip, which can help to prevent your hand from slipping while you operate the magnet. The thinner surface design is ideal for those owners who keep smaller tanks. The interior piece will float to the surface if it comes away from the glass while you clean. A set of fine brushes offers ample contact and scrubbing power. As with all magnetic cleaners, caution should be used to prevent the pieces from closing around the fingers on your skin. An automatic glass cleaner for those who are too busy. For those who a gadget-minded, the RoboSnail can offer you an automatic surface clean on a 24-hour cycle. Now, this isn’t for a typical betta fish tank. We added this into the mix to show you what is available out there. This glass cleaner is for larger tanks. The unit weighs two-pounds and is 5x4x2 inches. 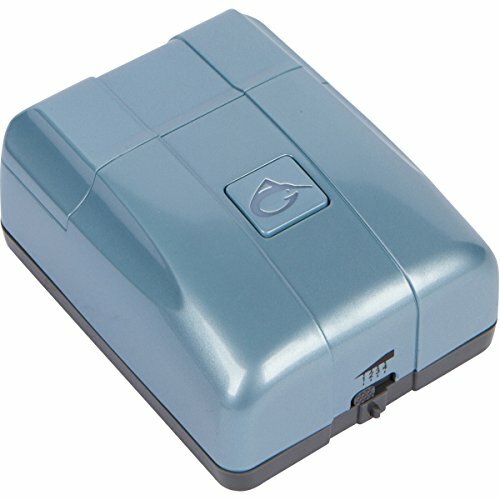 It is able to clean larger tanks with the battery power it supplies. The automatic design may be ideal for tanks in offices or for those who travel. The set-up is easy, as the timer marks the moment it is powered up. While the cleaner does make noise, it does not appear to bother fish in the tank. This unit can only clean one panel at a time and must be moved physically to different glass panes. Once programmed for a cleaning pattern, it does perform satisfactorily. It may occasionally leave spots, especially if they are stubborn. 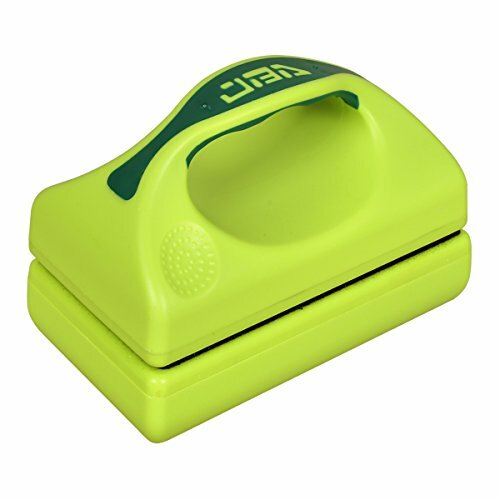 We feel that the KEDSUM Medium Green Magnetic Cleaner is the winner. HANDGRIP DESIGN: KEDSUM algae scrubber features unique handle design, convenient to use, user-friendly design makes people feel relaxed and comfortable when using it. The magnetic design allows the cleaning pad to attach evenly to the glass surface, providing maximum contact with each pass. The surface area is large enough to handle most standard tanks without causing extra work. A novice will appreciate the ability to see where they are cleaning, and the handle is ergonomic. The ease of use and comfort will encourage proper tank cleaning each time. We hope this article helped to clean-up away any confusion.